For a brief period of time, Luis Chacón attended the Escuela de Artes Plásticas y Aplicadas de Caracas (1945). In 1947, he travelled to Europe and studied at the Real Academia de San Fernando (Madrid), the Escuela Superior de Bellas Artes de San Jorge (Barcelona), and the Escuela de Artes y Oficios de La Lonja (Barcelona). At that time, his painting style was figurative and very much influenced by Mexican social realism. He returned to Venezuela in 1951, focussing for several years on metal engraving. Representative works of this period are the series Poder, Ficción y mascaras, and Sátiras políticas. By the end of the 50s, Chacón abandoned the figurative style and began to experiment with various tools and materials, producing work that alternated between informalista and abstract-geometric style. He made the sets of engravings Grutas (1962-1964), Ídolos (1964), and Metalgráfica (the 1966-1967), in which he explored the production of reliefs and textures as well as the application of color. One of his goals was to bestow autonomy to the graphic. In 1965, he received the Premio Nacional de Dibujo y Grabado. 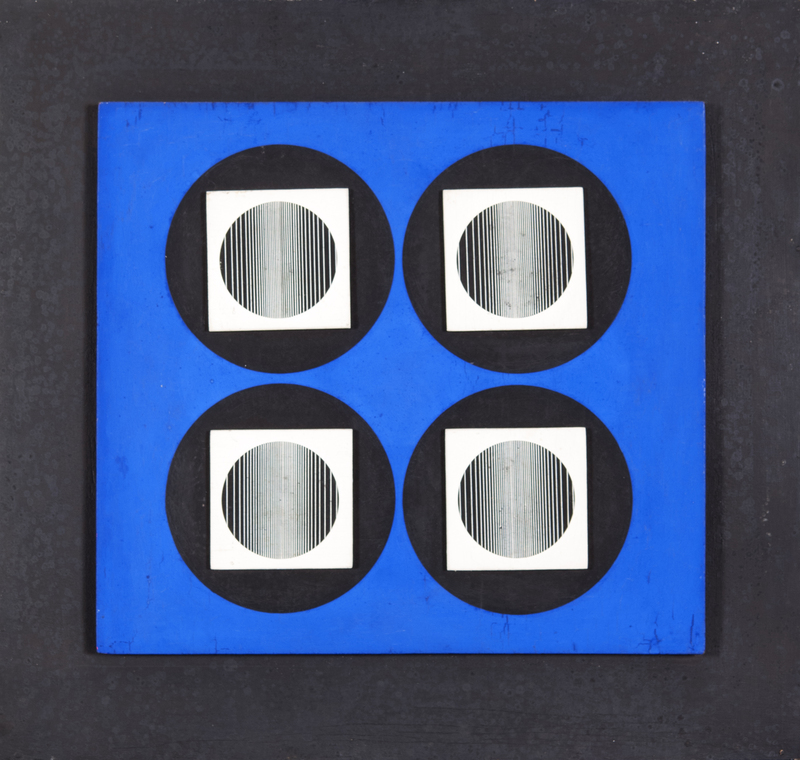 In the series Planetas (1967-1968), Chacón assembled matrices of diverse sizes incorporating circular emblems. In this graphic work he focused on experimentation in movement and reflected of light. His paintings at the end of the 60s, often adopting the assembly form, became openly kinetic, as illustrated by the works presented at the Galeria Estudio Actual (Caracas, 1969). In the series Activacción (1971-1974), he created effects of volume and movement by means of the multiplication of lines. This investigation continued with the development of the series Radiaciones (1974-1976), after which his work became three dimensional. The retrospective exhibition Trasportación de la materia was presented at the Sala Mendoza, in Caracas (1976), and his well-known Satélites (1978-1981) were presented at the Museo de Arte Contemporáneo de Caracas (1981). In these sculptured works, a double nucleus or axis of aluminum rods was projected in different directions, provoking a virtual movement of rotation. With time, Chacón made combinations of Satélites, producing complexes or, rather, constellations, to which he gave names taken from mythology or astronomy. The retrospective exhibition Huellas (Museo de Arte La Rinconada, Caracas, 1987) preceded one of Chacón’s last works in sculpture, the Catedrales transparentes, sophisticated structures in aluminum rods presented at the Fundación Celarg (Caracas, 1993). The Satélites were converted into painting in the mid 1990s, and were shown in the exhibition Integración at Trazos Galería de Arte (Caracas, 2004).